Australia’s houses are getting bigger, but usually not more sustainable—this is bad news for the country’s energy budget, say researchers from the University of Melbourne. Australia’s houses are getting bigger, but usually not more sustainable. In our recent study, we looked at the energy use of Australian houses, including the energy required to build, maintain and power our homes. 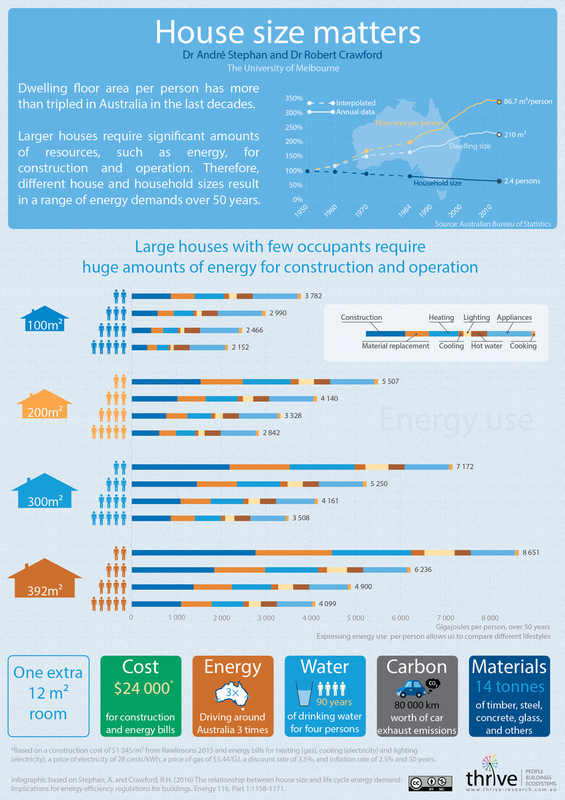 Perhaps unsurprisingly, we found that more energy goes into bigger houses. This is bad news not just for the environment, but also for our wallets. But these considerations are not always built into sustainability ratings. So whether you’re building, buying, or just curious, what are the most important things to consider? And how much does house size affect total energy use? Over the past 60 years Australian homes have more than doubled in size, going from an average of around 100 square metres in 1950 to about 240 square metres today. This makes them the largest in the world, ahead of Canada and the United States. At the same time, the average number of people living in each household has been declining. This means that the average floor area per person has skyrocketed from 30 square metres to around 87 square metres. We know that larger houses require more heating and cooling and result in higher energy bills. They also need significantly more materials to build and maintain, and more energy to manufacture and replace these materials. But how much more? That’s what we set out to find out. More energy goes into bigger houses. This is bad news not just for the environment, but also for our wallets. But these considerations are not always built into sustainability ratings. To systematically assess the relationship between house size and resource use, we analysed a typical new 6-star brick-veneer house in Melbourne’s climate. We then modified the house size from 100 square metres to 392 square metres using 90 different size configurations (we’ve only shown four in the graphic below). For each size, we measured both the energy embodied in the building materials and the energy required for replacing these over 50 years. We also calculated the operational energy use over 50 years for two, three, four and five occupants. Finally, we accounted for energy losses across the energy supply chain. Results show that larger houses use much more energy, but also that as size increases, the energy used in building and maintaining the house grows by more than the energy used to operate the house. For instance, the energy embodied in a 392-square-metre house alone is larger than both the embodied and operational energy demands of a 100-square-metre house with three occupants, over 50 years. Logically, more occupants mean less energy per person, as the resources are shared. Smaller dwellings tread more lightly on the planet and on your pocket. Based on data from Rawlinsons, each additional square metre of brick-veneer house in Victoria costs on average an extra A$1,245 for construction. Combined with the resulting heating, cooling and lighting energy bills over 50 years, the total cost per square metre exceeds A$1,988. Removing a 12-square-metre bedroom from your next house can therefore save around A$24,000 and avoid the use of huge quantities of resources. You might be thinking that smaller dwellings mean lower-quality dwellings. That’s not the case. Examples of small, well-designed dwellings are all around us. These can be designed for durability and low energy use, as in-fill in dense urban surroundings, favouring natural daylight and ventilation, in symbiosis with nature or as smart urban apartments. It is important for developers and architects to provide homes that are better designed for comfort and the environment while still being affordable. The benefits of smaller dwellings go beyond the household itself and have repercussions at the city scale. Small homes – perhaps a mix of small houses on small plots, together with some larger apartment buildings – can save valuable space that can be used for communal infrastructure. This would have to be done considering walkability, access to amenities and other factors, but can lead to much more efficient neighbourhoods from an infrastructure and transport perspective. So what needs to happen? How do rules need to change? Current energy efficiency regulations don’t account for the energy embodied in building materials, and so fail to adequately capture house size. Most energy efficiency regulations also only measure energy use per square metre. Using this metric, larger houses appear to be more efficient because energy use increases at a slower rate than house size. The Australian 6-star standard does include house size when considering heating and cooling, but other certifications don’t. Under these other certifications, a larger house would therefore be easier to certify, considering everything else constant. This is ironic since larger houses use significantly more resources, both for construction and operation. We need to revise current energy efficiency regulations to include embodied energy and other measures of energy if we are to reduce the total energy and broader resource demands associated with buildings. While our research investigated the relationship between house size and life cycle energy use, it did not consider apartment units. With a growing number of apartment buildings being constructed in Australia, the next steps include investigating a range of apartment design factors and their environmental implications. By deepening our understanding of how to design better dwellings, we will ultimately help reduce resource use. We’ve studied house size, but that is not the end of the story. André Stephan is a postdoctoral research Fellow, University of Melbourne and Robert Crawford is Senior Lecturer in Construction and Environmental Assessment, University of Melbourne. This article was originally published on The Conversation.